Are you ready for a four-wheeling good time? Lake Havasu is one of the most premier adventure sports destinations in the United States. There are a few things you should be aware of, especially if you are interested in ATV rentals. You want to ensure a safe and exciting time while doing everything Lake Havasu has to offer. Here’s a guide to ATV rentals in Lake Havasu. Before you book any vehicles for your Lake Havasu vacation, you should know that there can be a learning curve for some ATVs. Research ATV operation and find out whether it’s for you. Then you’ll be able to decide what to rent. Many companies will rent you ATVs in the Lake Havasu area, but not all of them are equal. Look for a company that’ll let you rent an ATV for times that fit with your schedule while remaining affordable. If possible, you should schedule your ATV rental in advance. If you try to rent any vehicles the day you want to ride them, they may not be available. Once you decide on an ATV to rent, get as comfortable as possible with its operational mechanics before you hit the trails. This process is crucial to ensure your safety while riding. Take a seat on the ATV and get familiar with its controls. Practice accelerating and braking until you can get a feel for the vehicle. You may have to perform these maneuvers quickly and they should be reflexive. It’s imperative that you wear a helmet and safety padding when you’re out on the trails. If you fall off the vehicle while traveling at a high speed, you might be subject to serious injury. Many trails are in relatively remote areas. If you’re injured, it may be difficult to transport you to a hospital quickly. In these circumstances, wearing a helmet as a preventative measure can save your life. Along those lines, you should always carry a map or satellite phone so that you can find your way back to your rental location quickly. For longer trips, carry energy bars or fruit for a quick burst of energy. Of course, don’t forget the water. Dehydration is a serious issue on the trails so make sure that you’re in the best position to enjoy yourself. Lake Havasu is a beautiful natural wonder. When you’re out on the trails, treat them with respect. Only dispose of trash in designated receptacles. Furthermore, don’t take any chances. As in any natural area, your surroundings can be unforgiving. Stick with your group and stay on designated paths. If you get hurt away from the main hiking areas, it might be difficult for rescue crews to locate you. 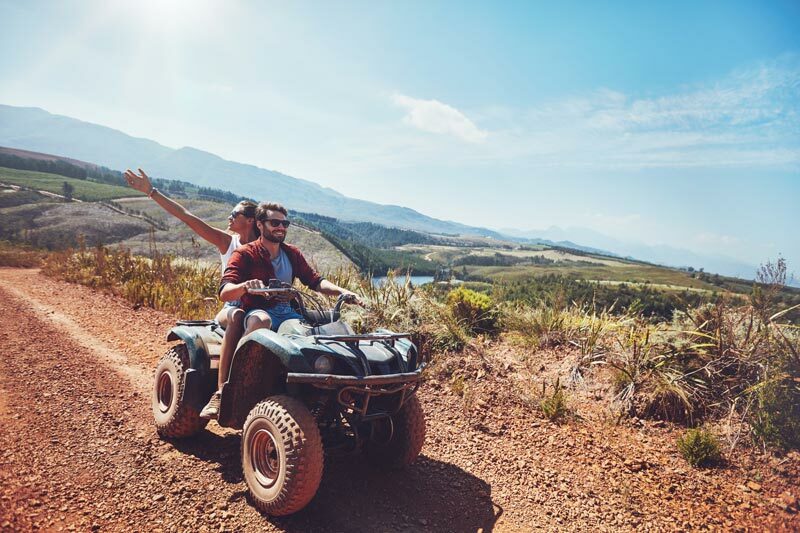 An ATV rental can turn an average vacation into an adventure-filled excursion. For more information on renting sporting equipment in the Lake Havasu area, please contact us.